J. J. Starbuck: Mystery and Suspense on Television. Dale Robertson stars as the titular Jerome Jeremiah Starbuck, a wealthy Texan, who uses his influence and contacts to help good folks in trouble. Several episodes of the series featured Ben Vereen as Tenspeed Turner, a character he played several years earlier (and on a different network) on Tenspeed and Brown Shoe. 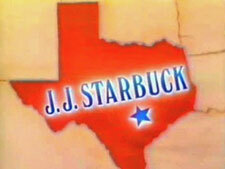 J. J. Starbuck aired just one season on NBC.